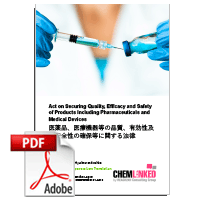 Act on Securing Quality, Efficacy and Safety of Products Including Pharmaceuticals and Medical Devices (also known as Pharmaceutical and Medical Devices Law) is the overarching act that regulates the manufacture, importation, and sale of drugs, quasi-drugs, cosmetics and medical devices in Japan. Note: This translation was published by Japanese Law Translation and is an unofficial text. 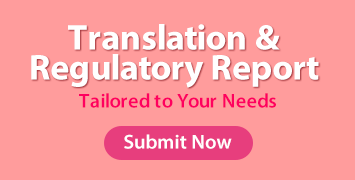 The translation is only updated to the 2015 revision while the revised edition of 2016 is in effect. This document should only be used as a reference for understanding Japanese regulations and in case of any discrepancy between the English and Japanese versions the original Japanese version shall prevail. Chapter IX Handling of Pharmaceuticals, etc.